A man from the northwest suburbs is in a big, big pile of trouble after he allegedly signed for a U.S. mail package that contained $317,000 worth of methamphetamine in the 2100 block of West Belmont last week. Kane Kellet, also known as William Curry and Harjodh Singh, signed for the package at a shipping store around 2 p.m. last Thursday and police pulled him over a few minutes later in the 2800 block of North Clybourn, according to court records. Prosecutors say the package contained 950 grams—slightly more than two pounds—of meth and Kellet was carrying 20 Ecstasy pills and a fake ID. 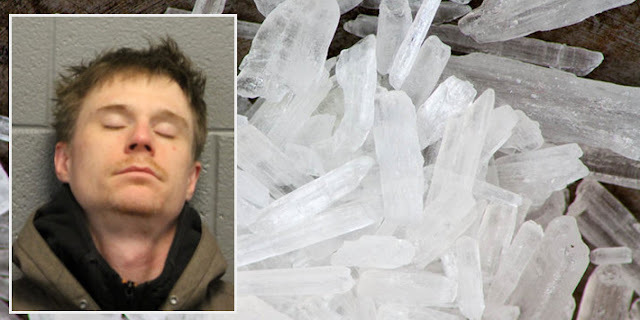 Kellet is charged with Class X felony manufacture-delivery of methamphetamine; felony possession of methamphetamine; felony possession of Ecstasy, and felony possession of a fraudulent ID. Judge John Lyke ordered him held without bail. Methamphetamine, also known as speed, Tina, and crystal is a powerful stimulant that allows some users to stay awake for days at a time. Did we mention that Kellet lives in Crystal Lake? Yeah, he does. Or did.